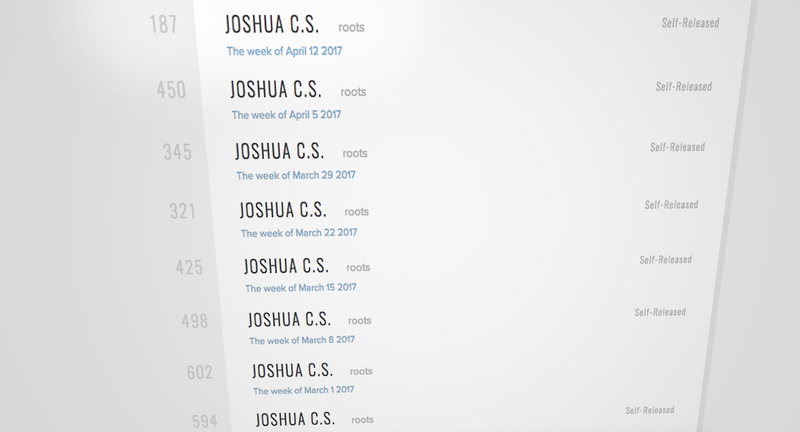 ROOTS reaches #187 on Radio Charts - Joshua C.S. My new record, “ROOTS” has officially reached the top 200, and doesn’t show signs of stopping! I just wanted to take a brief moment out of the day to appreciate this. I mean, as an artist, especially as a career independent artist, it’s been a while since I’ve seen success like this. I know it only lasts a short while sometimes, and I know this isn’t the top by any stretch of the imagination, but what the hell – I’m allowed to say “what the hell” every once in a while right?! If you haven’t had a chance to hear the record yet it’s on Spotify, Apple Music and iTunes, Soundcloud, and you can hear the record and purchase here on this site. I encourage you to check it out. It’s a benchmark in my career, and it’s all bout my life and these last couple years – what’ been happening. Here’s a link to the charts. Thanks for all the love and support folks 🙂 Couldn’t do this without a loving support system. See you at a show soon!